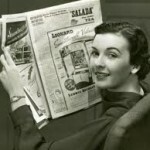 I recall fondly looking forward to Saturday morning when I would make my way to the kitchen, make a cup of tea, scramble some eggs and begin to pour my way through the Saturday newspaper, soaking in all forms of information from travel destinations to the latest world events to the crossword puzzle. Through the week, I rarely made the time to read anything more than the entertainment section, so Saturday was a treat which quenched my thirst for knowledge. These days, Saturday mornings look a little different. We have cancelled our subscription to the local newspaper as it has become thinner and thinner each month, and an electronic copy arrives in my inbox. All members of our family search for their specific information needs online. 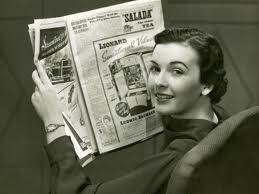 I still make that cup of tea, but not before I turn on my iPad and begin my morning reception of information. My first tap on the pad goes to my “inbox” and my gmail account, answering any emails that may have arrived over night. Then I quickly check out Facebook and catch up on what my friends are planning for the weekend, enjoy great photos and a variety of thought-provoking quotes. My final and most fruitful tap lands on Twitter. It is here that I am bombarded by information from some of the most fascinating education gurus, breaking news and links to blogs, pictures, links etc. I scroll through lists of Tweets, book-marking those that I want to re-visit, searching for others to “follow” and watching my own list of “followers” increase. Never before have we had so much information at our finger tips. Gone are the days of having to methodically search for information, it now comes to us at a remarkable pace. Our job is to figure out what to digest and what to “pass on” and how to teach that skill to today’s students. Just being able to search for information is no longer good enough ~ We need to be able to do something remarkable with that information. What skills do our students need to critically analyse all of the information that they have coming to them? What types of tasks/assignments do we need to develop and challenge our students to complete, with all of the information at their fingertips? What about, “Saturdays of Days Gone By”? In our ever changing, ever increasingly fast paced world, forms of communication continue to morph with each new form of technology. 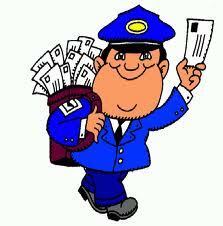 Gone are the days of waiting to use the phone because of party lines and waiting days for a mailed letter to arrive at it’s destination. Even fax machines seem slower than scanning a document and instantly emailing it. When we want to show our appreciation we send off a quick text message or an email. Don’t get me wrong, a sincere “G’Morning” text message can instantly put a smile on my face. I love opening my inbox and finding pleasantries from friends and colleagues. But the other day, I received a handwritten letter of “Thanks and appreciation” from a colleague. 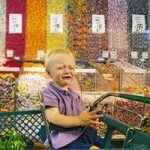 I was so thrilled. It is rare to receive anything other than bills or advertisements in the mail these days. The fact that he took the time to not only write the letter, but to mail it was all a part of the pleasure of receiving it. Have we become so focussed on getting our message to the intended party in a timely manner, that we’ve forgotten that “how” we send the message can say just as much as the message itself? Each summer I select a few “professional books” to tackle, some old ones that I haven’t cracked the covers on yet and some new ones that have graced my desk throughout the year. 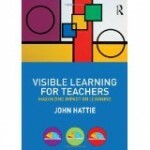 As this summer begins, I find myself revisiting an old one on “Energizing Staff Meetings” and a new one by John Hattie, “Visible Learning for Teachers”. I had the pleasure of seeing John speak earlier this year, in Toronto, after I had read his first book, “Visible Learning” Within the preface of his latest book, Hattie coins the phrase, “Know thy Impact” and then he goes on to refer back to the phrase throughout the book. I’m reminded of a time when I was a student in grade 6. Our teacher was visibly upset with our class as we would come up to his desk one at a time and have him check our world maps only to find that many of us were not copying the names of the countries properly from the Altas (I could do a whole other blog on such a antiquated lesson, but I’ll leave that for another day). I can recall feeling confident that I had checked and double checked the spelling of each of the countries and then venturing up to stand in line with my peers. As I proudly submitted my neatly coloured world map for inspection and approval, I was anxiously awaiting the obligatory, “Well done, Susan!”, instead I was horrified as he stood up from his desk, marched over to the board and bellowed, “How do we spell, Australia?” I had added an extra “I” before the “l” thinking that the word “trail” was somehow found within the name of the country ~ as that is how it sounds to me. I sheepishly apologized for my mistake, corrected it and resubmitted the assignment. 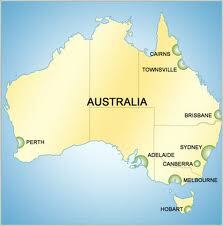 To this day, I stop and second guess myself, each time I have to spell Australia. Our grade 6 teacher was not a tyrant or a terrible person. Actually, we stayed in touch through the years. I volunteered in his class as I went through university and teacher’s college. I even chaperoned a couple of his grade 8 year end trips. I recall as I was promoted to principal, he surprised me with a visit and I was so touched. My point is that as teachers, we probably have no idea of the impact that we have on our students every day. Our students are always watching us, listening to us and learning from us. There is a great responsibility in that and we need to appreciate and embrace it. We need to “know our impact”. Did I happen to mention that John Hattie is from AUSTRALIA? Awhile ago, I book marked this tweet about student behaviour knowing that I wanted to revisit it once the dust of the last few weeks of the school year settled. Watching a mother trying to redirect her son, who was definitely not leaving the store without a chocolate bar in his possession, prompted me to get my thoughts down in a post today. What causes students to misbehave in class and what do we do when that happens? There are a variety of reasons why students misbehave in class which range from factors beyond our control (home life, peer relationships etc.) to factors that we do control (programming, providing challenging learning tasks, student-teacher relationships). 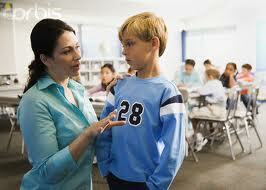 Great teachers know that punishing a student will not change misbehaviour. Sending the student to the office will not change misbehaviour. Suspension will not change misbehaviour. The student needs to know that we care enough to dig deep and discover the root of the misbehaviour. Only then can we begin to replace the misbehaviour with behaviours that will allow the student to be available for learning. But the question in this post is, how do we use a student’s misbehaviour as a learning opportunity? What are some of the strategies that you use to demonstrate that you care enough to help the student learn what is appropriate and what is acceptable? How do you successfully replace misbehaviour with behaviours and attitudes that will allow the student to be a welcomed learner in their classroom?